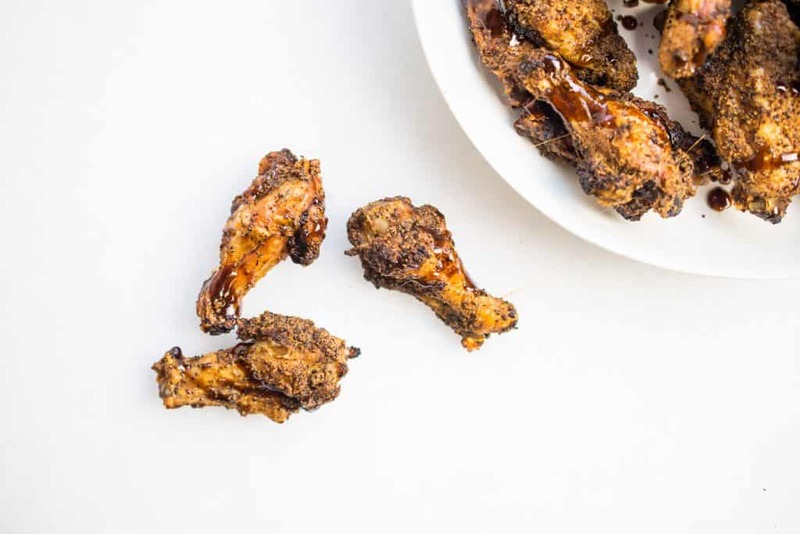 Crispy wings are a must and I have perfected the crispy wing oven method, as you know if you’ve made my Keto Wings or my Ginger Lime Wings. 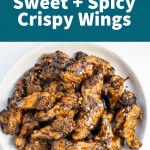 However, I must say, these Sweet and Spicy Wings are my FAVORITE recipe yet! They are a huge crowd pleaser and perfect for The Big Game! I use Butcher Box Party Wings that come trimmed and ready to party. 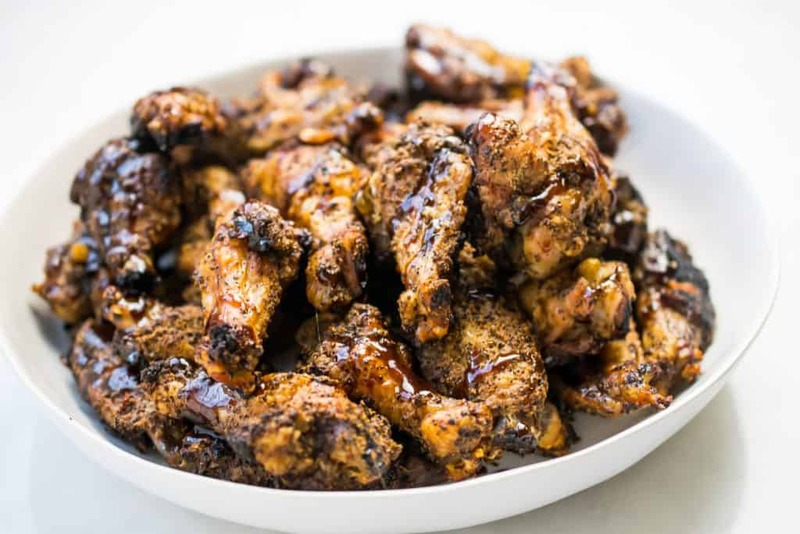 Your Free Pasture Raised Wings are Perfect For These Sweet and Spicy Wings! They come cut into drummettes and wingettes. Which you will toss in a homemade (corn free) baking powder, again, the formula for that is in my Ginger Lime Recipe, here, that recipe is also AIP compliant. That baking powder mix is what gives you THE CRISPY. Is a dry rub that consists of several dried spices like onion powder, garlic powder, ginger and white pepper (white pepper is much hotter than black pepper) and coffee! Yes! I used ground decaf coffee because we had these for dinner and I’m sensitive to caffeine in the evening, but regular coffee will do. The rub has a super savory flavor with a mild heat to it. If you’re a firebreather you can double the white pepper. 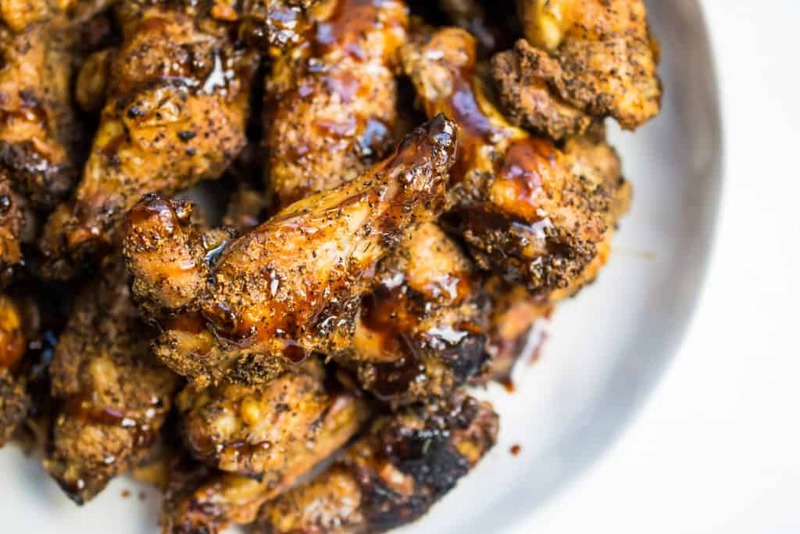 This glaze that you toss the wings in after they cook is like a savory caramel sauce. 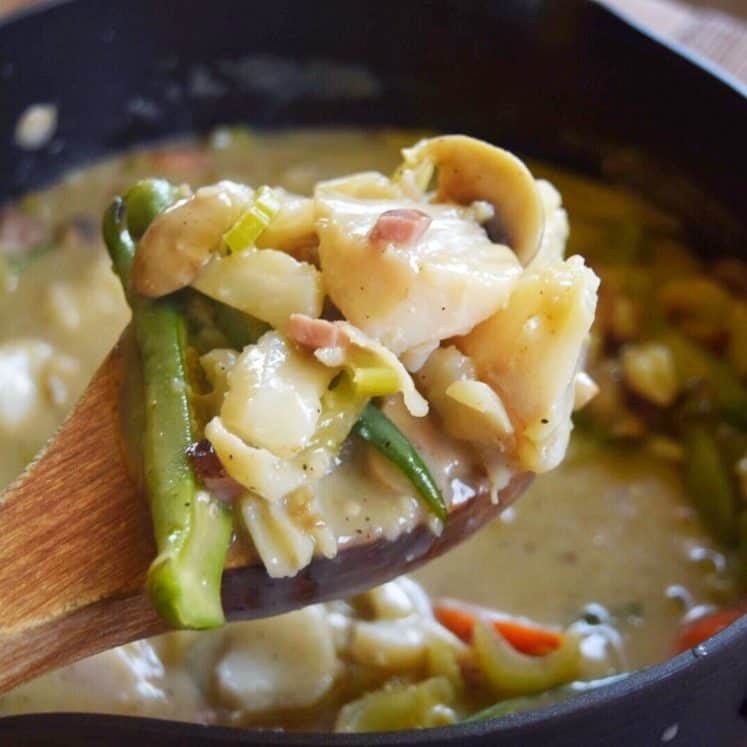 A simple reduction of red wine vinegar and coconut aminos. You need to keep it warm or it will harden to a super thick glue-like substance. But once it’s on the wings then cooled it creates the most magical, sticky, sweet, topping. It’s FREAKING MAGICAL. 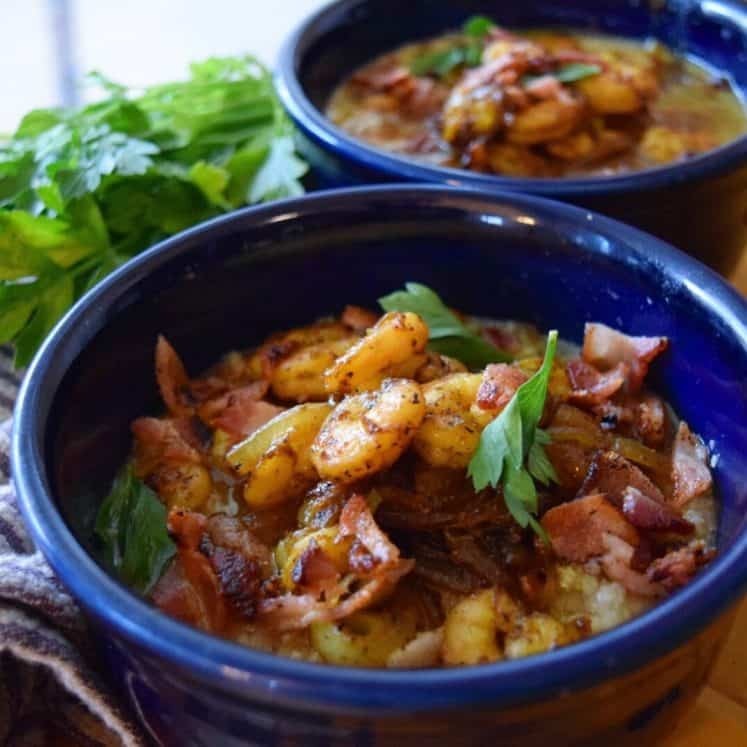 If you don’t do coconut, even in the form of coconut aminos, you may use balsamic vinegar for the reduction. And remember to Ente THE MAKEOVER GIVEAWAY HERE. 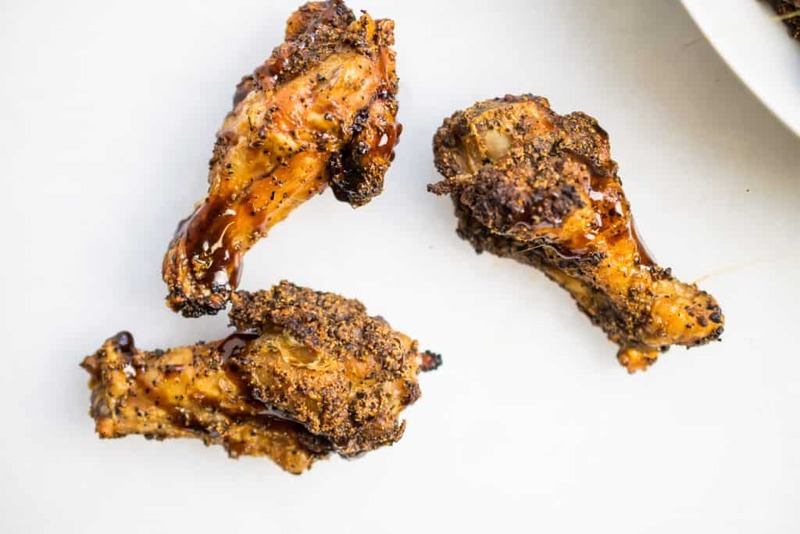 The most additive wing recipe just got a healthy makeover. Keto, paleo, Whole30. Check, check, check. 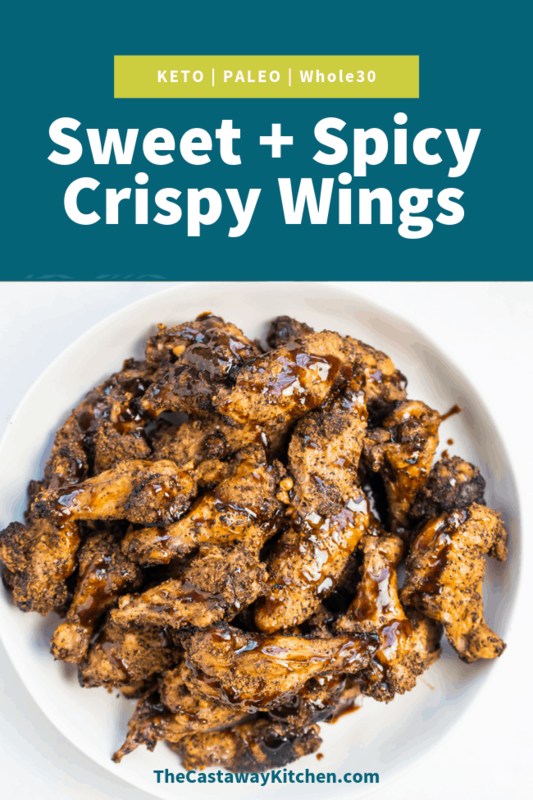 Sweet and spicy wings for the win! Mix the seasonings together in a small bowl. Measure out the baking powder and set it aside. 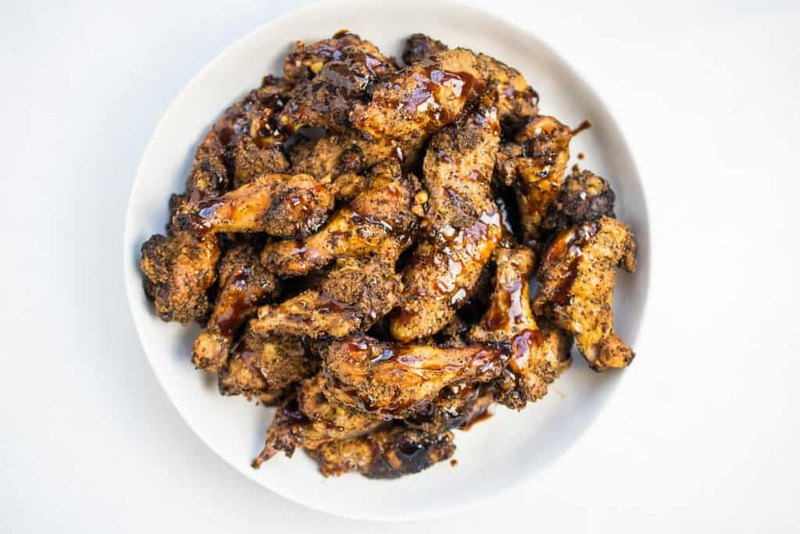 Put all of your wings in a large bowl and use a paper towel to pat them dry. If there is pooling liquid in the bowl, clean it up. You want the wings pretty dry. Add the baking powder to the wings and toss the bowl to evenly coat the wings, you can also use your hands to toss and mix. Add in the seasoning mix and toss and mix to coat. 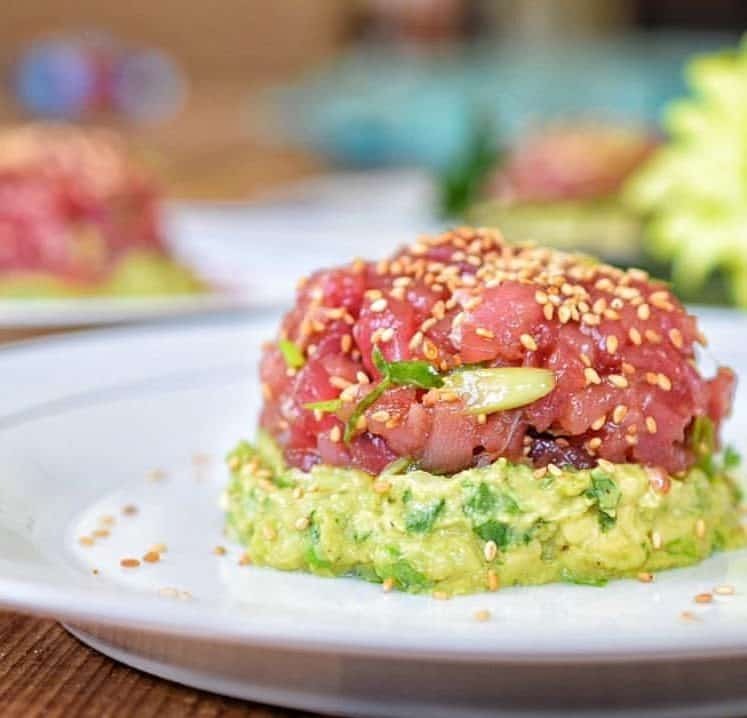 Spray a sheet pan with a little avocado oil or coconut oil. Arrange your wings on a sheet pan all lined up, close together but not touching. Bake on the middle rack at 250F for 40 minutes. Open the oven, spray the wings with a little avocado or coconut oil. Close the oven and set the oven to 425F. Bake for 45 minutes. 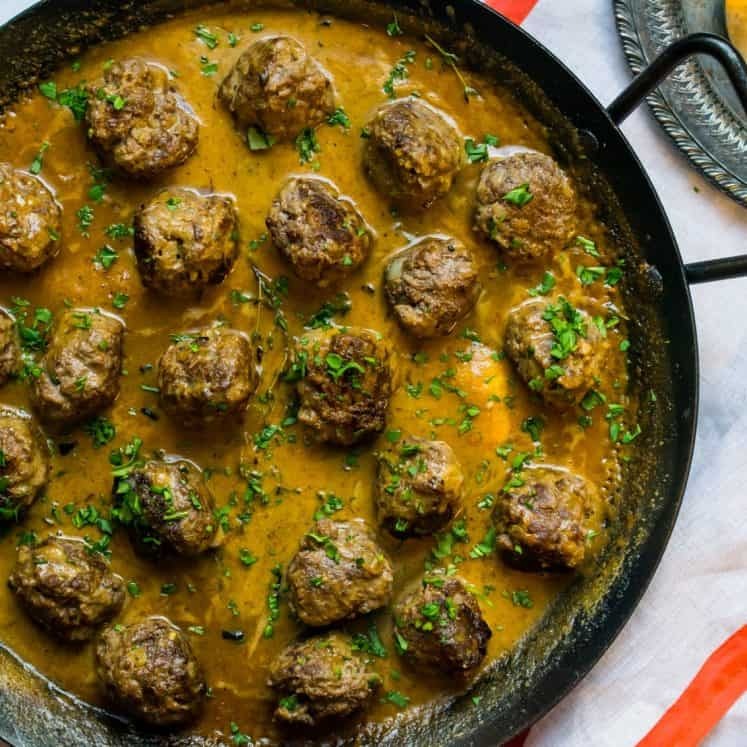 When there is 25 minutes left on the timer, combine the sauce ingredients in a small sauce pot and simmer over medium-low heat for 20 minutes until bubbly and thick. It should coat a spoon easily. Remove from the heat, but keep on the stove to keep it warm. 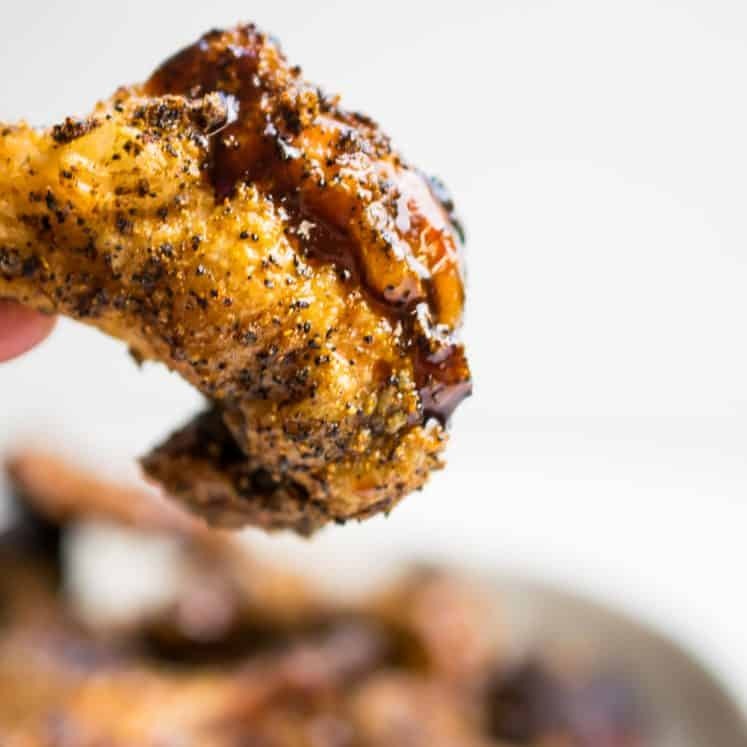 When the wings are done use a spatula or tongs to remove them from the sheet pan, put them in a large bowl, drizzle the sauce in and toss the wings to coat. 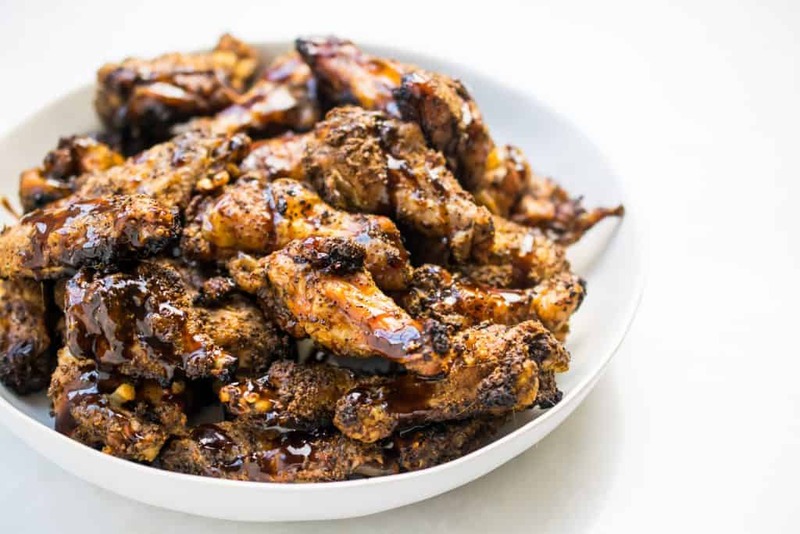 Or you can serve the wings on a platter and drizzle the sauce over them. See post for details and substitutions. Thanks so much Cindy!! Hmmm the recipe cards are via an Plug-In. I will write to their tech support and see what they can do. What if I don’t use coffee for religious reasons. Can I just leave it out or should I replace it with something?